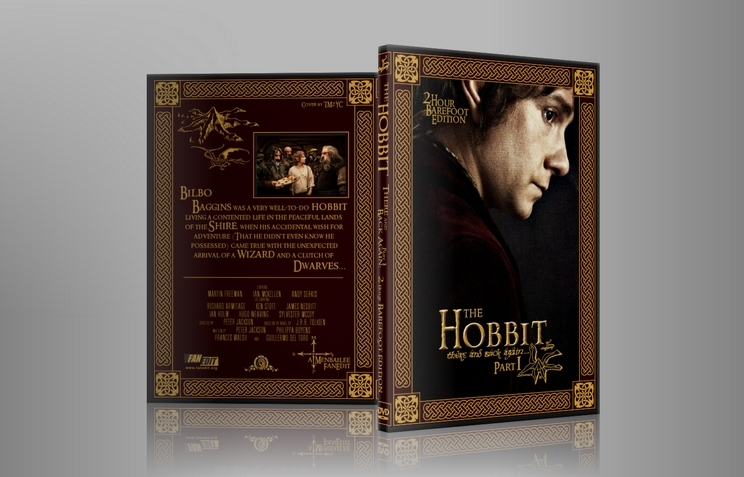 I set out to create a leaner, cleaner first part to The Hobbit. I do not demand purism relative to the book; instead, I insist on solid storytelling. Although I've cut most sequences that looked outright ridiculous, I kept Radagast and several other features that don't appear in the book or are more directed toward children, but which contribute to the story. Azog is gone, save only in an appearance as the angry orc in pursuit of Thorin & Company after the death of the Goblin King, the flashbacks are much condensed and differently placed, Frodo is gone, and we are left with a quicker and more magical return to Tolkien’s famous novel. As soon as I watched The Hobbit, it became my highest fanedit priority. As might be expected for a thin book expanded into three long films, An Unexpected Journey turned into a bloated and muddled mockery of the grandeur we remembered from Jackson's Lord of the Rings. The Hobbit got mired in set pieces, and it thematically undermined Bilbo's story with his violent involvement in the superfluous White Orc plotline. Meanwhile, scenes like The White Council or the Stone Giants provided something of a snoozer but advanced the plot not one whit. I aimed to improve pacing, to attain greater thematic consistency with Tolkien’s Hobbit, and to remove some laborious absurdity, all while keeping the movie hopefully in continuity with the future films--or at least an edited version thereof. I use the Blu-ray as my source. I am not encoding to Blu-ray at this time for reasons of file size and convenience. For the DVD release, I am offering both a version with hardcoded letterboxing (which is the standard on most DVDs), and also a version with the full 720x480 pixels filled, for which the aspect ratio can either be corrected manually, or simply allowed to fill the entire screen with a slight stretch to the image. TM2YC for feedback, a beautiful cover, and a reworked matte that I used for the final shots of a more distant Erebor. Also my thirteen friends and my girlfriend who attended the screening party for the first completed workprint. Prologue flashbacks truncated and re-ordered to make dwarves more sympathetic, and moved to where Bilbo learns the story during the unexpected party. A few establishing shots are altered to fit the scenes into context. Misty Mountains song uses footage excised from the flashbacks, converted to slow motion, to create a montage. Radagast stays! He sets up the Necromancer plot for the next movie. However, his appearance to Gandalf happens after Rivendell rather than before, and Gandalf is implied to separate from the dwarves with him. A shot back to the sword helps explain what Gandalf has just received. The entire warg chase scene is cut. White Council removed entirely. Ugh. Every single frame of Gollum kept! Goblin chase scene cut from five minutes to one. This involved many small cuts. Many small cuts reduce the Pale Orc from a nemesis of Thorin's to the Really Angry Orc who pursues them after they killed the goblin king. The dwarves and Bilbo do not leave the tree once chased up. The Eagle rescue has also been trimmed; they do not fight the wargs except to drop a tree on several. Our only explanation for Thorin's KO is that falling from trees and eagles can be rough on a dwarf; this is the only significant continuity issue for which I could not find a fix. Foreword: I haven't seen the original in sometime, which prefer for watching edits and I also didn't review your changes ahead of watching, which I also prefer. I looked at the edit list back when I downloaded the edit, but I like to not know exactly what I'm walking into so I don't watch an edit for a few months or more after downloading them. What I liked: The pacing was better and it felt more logical in many ways, and for that reason the narrative was greatly improved and streamlined. 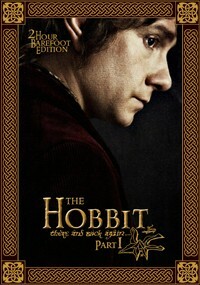 The cuts felt right, and they play of making some of the Dwarf story a dream for Bilbo was fun. What I didn't: The movie was edited together amazingly, and I didn't mind that some of the scenes must have come from the DVD extras or something of the like (visually jarring), but the only editing section that really stood out for me was when the dwarfs were about to battle the trolls and cut, just felt a little too jumpy for me. Overall: I'm not sure I'd see this version over the original but it has its ups. Extra: Keep up the good work, and I think the formula you have might benefit if you tried to put all 3 parts in to one 3 hour movie. After viewing a number of Hobbit fanedits, (all superior to the original theatrical release), I feel that Menbailee's is the closest to my liking. Loved the rearranging and dispersing of the opening scenes. LOVED the elimination of the sled and orc chase. I think the transition from forest to narrow crevice works great. A lot of the ridiculous parts were wisely cut. I now have a version of part one that I actually enjoy watching. However- I would have done more cutting (if I knew how to edit). I would remove the first Radagast scene and all of the sled and rabbit parts. It could be easily done. I'd try to find a way to change the scene where the ring twirls in the air and lands right on Bilbo's finger. I'm not sure how this could be accomplished, but it was done in TFOTR- let's not do it again. The same with Gandalf whispering to the moth. It was great in TFOTR, it does not need to be in the Hobbit too. I too like the pine-tree escape much better in this fanedit. As far as how to get around Thorin getting hurt if there wasn't a fight with the orcs, is simple. Cut out the part of the scenes where the eagle is carrying him. I would just transition from the eagles flying to the party standing on the rock as the eagles fly off. No need to show Thorin hurt at all and Gandalf's "healing" of him. One thing I would have left in the film is a little of the Giants, just enough to see that the legends are true and then skip to the group looking for shelter. All in all, the best telling of part one of The Hobbit. Valar be praised, my favorite franchise has been saved! A month ago I had no idea what a fanedit was, now I'm thinking my fantasy/sci-fi collection may eventually be completely replaced with burned material! Most importantly, it seems like the faneditors on this site are dialed into the most basic need for most movies - a version that does not cater to the silliness and inane action so popular with children (and many adults!). I watched this edit a second time with my kids and found they mentioned how they missed the scenes that I disliked the most. There you go. OK, so specifically to the work of Menbailee here are the points I liked best about this edit: the focus on Bilbo (huge), shuffling and editing of scenes to create more mystery and suspense (dwarf flashback, etc), keeping most all the gollum material (it was pretty well done in the original), goblin king just disappears off the edge (that's enough, he's dead), short goblin escape (I hated the original), and wow the video/audio was outstanding (I saw the background details like never before), and much more I won't try to list it all. Here are some things that in my humble opinion could be changed: Gandalf lops the head off a goblin with almost enjoyment (then lectures Bilbo about not being hasty to deal death - I can't see Gandalf ever taking a death lightly, even a goblin), how does the goblin king know Thorin so readily, Thorin mysteriously injured when no one else is (as explained in other reviews this might be unavoidable), still too much CGI (particularly pale orc, so sad they went away from real actors. I watched the FOTR again and found the costumed orcs so much more engaging and frightening. How I wish this orc could be removed entirely!). Uncertain (not really sure if these should stay or go): plate tossing - it's over the top and really too bad, because it's a fun scene in the book. Troll dialogue - really pulls you out of serious mode with the movie and it's hard to believe they are any relation to the LOTR trolls. But I'm on the fence because the Hobbit is meant to be a bit lighter than LOTR, and the actor for Bilbo (Freeman) does an excellent job in the troll scene. I suppose I would need to see an edit without these scenes (or seriously cropped) to decide whether a change works. Wish list: I wish for fanediting to advance to the point that beards can be put on the freaking dwarves! Durin would roll in his grave to see the 5 O'clock shadow on Thorin and his nephews (and some of the others with weak beards). I can't get over it honestly, and ultimately can't give a 10 to enjoyment unless that is rectified some day. I get trying to give the dwarves some individuality, but it could have been done with suitable beards. Please someone figure out how! Until then I can never enjoy the movie as a "10". Ultimately though, Menbailee, you made my day. I was depressed coming out of the theater, I wanted to like the movie so badly but could not. 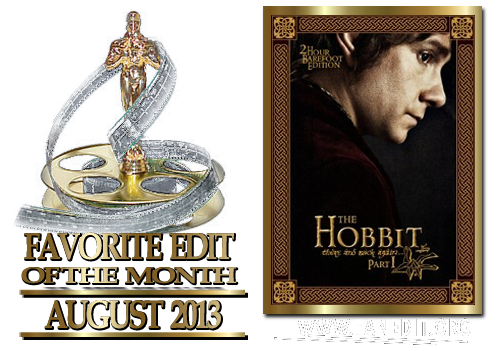 Now I can, and so hope you will tackle Desolation of Smaug, though that be a much more challenging task! I really enjoyed this edit - it cut out most of the superfluous, silly action scenes, tedious added in segments with Galadriel and Saruman, and got back to the actual narrative of the story of the Hobbit. Gone are the White Orc, most of the prologue, stone giants, White Council, Frodo and more. What remains is focused, tight and entertaining. There are a couple of noticeable huge jump-cuts - you sometimes wonder "why are the walking through cliffs, when they were in the forest half a second ago". The most noticeable was when the Dwarves start attacking the Trolls. I might have let that play for a few seconds longer before cutting to them tied to a spit, but I am being VERY picky. I suppose you have to work with the material you have! By cutting the fat, this feels far more like one of the original LotR films than the theatrical version. It doesn't feel the need to constantly reference the wider Tolkien universe and the previous films, and just gets on with telling its story. This was a good edit. I quite liked The Hobbit AUJ when I first saw it but the second time was really bored and saw a lot of flaws. This didn’t “fix” everything for me but it was much more enjoyable. Recommended drink: A little beer and some cake – seed-cake if you have any.